Thanks for stopping by! My name is Krista Sexton, I am a wedding and portrait photographer serving Indianapolis, Southern Indiana and beyond. My husband, James and I made the move from our condo in the city to a cabin in the woods about 3 years ago...and we couldn't love it more! We all need that friend. The one who is able to be brutally honest in a way that leaves you wanting to change yourself for the better. My natural tendency is to sugar coat things – pretty them up, sandwich them with compliments, and hope that my friends hear the truth through the confetti and rainbows. The “here is the honest truth and it’s okay” thing, is something that I’ve had to work on…a lot. I’m also a processor, so when I am forced to react in the moment, I often “pretty” up the situation, even if it’s not how I really feel. Later I’m kicking myself because going back to have the “I know it seemed like I was okay with this but I’m actually not” conversation, is WAY harder than the honest, in the moment, truth, conversation. Perhaps some of you can relate. Heather, is the former and it shows. It shows in her friendships. It shows in her family. 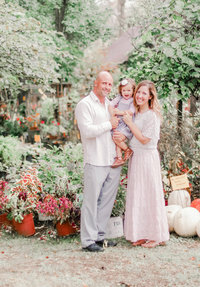 The relationships she has with her kids, Tristyn and Autumn, and her relationship with her husband, Aaron. When relationships are built on open truth and cultivated in genuine love, they are rarely destroyed. When the storms come (as they do for all of us) these relationships will stand because they are built on something real, the foundation is strong. I know it is this strength that will carry their family through as they send Tristyn off to begin his training with the U.S. Air Force. My momma heart cannot begin to comprehend the range of emotions Heather and Aaron are feeling. While they send Tristyn off with all the pride and patriotism they have, saying, “good-bye,” is never easy. Tristyn, you have been raised on truth. Stand on that truth, it is strong and will carry you through. Hold on to this truth, it is the light that will guide you in this dark world. Remember that building people up may make them feel good for a time, but building relationships built on truth and love is building relationships that will last, relationships that will be strong enough to go the distance when you need them to and foundations that will stand when everything else is falling. Heather, I cherish your friendship. Thank you for everything you’ve taught me over the years but most of all thank you for speaking truth without hesitation.